The ACRL Scholarly Communication Toolkit was initially launched in 2005 by the ACRL Research and Scholarly Environment Committee (formerly the Scholarly Communication Committee) to support advocacy efforts designed to transform the scholarly communication landscape. preparing presentations on scholarly communication issues for administrators, faculty, staff, students, or other librarians. All materials that are prepared for and directly part of the toolkit are made available under a Creative Commons Attribution-Noncommercial-Share Alike (CC-BY-NC-SA) license. In 2016, ACRL conducted a major update of the Toolkit and migrated it to ACRL LibGuides. The Toolkit will continue to be updated and maintained by members of the Research and Scholarly Environment Committee's Toolkit Editing Team. In 2003, ACRL defined scholarly communication as "the system through which research and other scholarly writings are created, evaluated for quality, disseminated to the scholarly community, and preserved for future use. The system includes both formal means of communication, such as publication in peer-reviewed journals, and informal channels, such as electronic listservs." 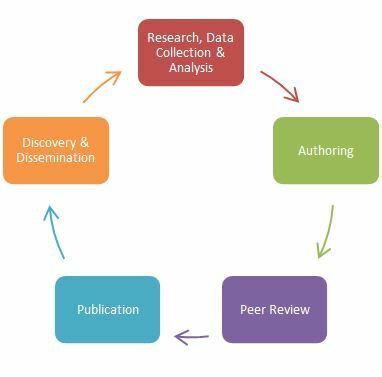 Scholarly communication is frequently defined or depicted as a lifecycle documenting the steps involved in the creation, publication, dissemination and discovery of a piece of scholarly research. There are several actors or stakeholders present at the various stages in this lifecycle, including researchers, funders, peer reviewers, publishers, and, of course, libraries. Historically, the role of libraries in the scholarly communication lifecycle was confined to information consumer -- they collected and organized scholarly resources for discovery and use by others. However, technological innovation in production and dissemination of scholarship, challenges to traditional publishing practices concerning business models and intellectual property management, and efforts to increase access to scholarship have presented opportunities for libraries to leverage their services and expertise to advocate for and bring about positive change. In this Toolkit, users will find information and resources to assist them in developing programs or enhancing current offerings aimed at these and other endeavors at their own libraries. Academic libraries are strategically positioned on account of existing relationships with publishers, faculty, researchers, authors, students, and administrators to be not only a resource but also a leader and change agent in the scholarly communication lifecycle, and we hope that content provided here assists libraries in achieving their strategic and programmatic goals. The Toolkit was designed to provide its users with a basic understanding of scholarly communication issues in the context of their impact upon libraries. For every issue covered here, users will find a brief introduction to the issue along with links to additional resources that have been curated and reviewed for relevancy, currency, and accuracy. Users will also find various tools, presentations, handouts and other takeaways that they can utilize as they develop their own local resources. Users are also welcome to use portions of this Toolkit LibGuide to populate their own local LibGuides. We encourage contributions to the Toolkit from its users and the academic library community. If you have a tool or resource that is valuable for advocacy and to the discourse of scholarly communication, please share it. This may include a paper, presentation, handout, video, or other type of useful material. Email your contributions to the Scholarly Communication Toolkit Editing Team. Creators will retain copyright to all materials accepted. We ask you to explicitly allow others to copy, distribute, or modify materials for local use or educational purposes with attribution by selecting a Creative Commons license for your contribution. Bring the ACRL Scholarly Communication Workshop (aka "Roadshow) to your library. For more information, including application instructions, visit the Workshop website. Materials from previous Roadshow events are posted on this guide. Attend scholarly communication forums and presentations at ALA Midwinter and Annual Meetings and the ACRL Conference. Check out the 101 Innovations in Scholarly Communications to discover and explore the large variety of tools and resources available to researchers and persons assisting them through all phases of the scholarly communication lifecycle.